Cast members of “Clint Black’s Looking for Christmas” perform the Christmas story at their local church. If you’re looking for a friendly, warm story that upholds the meaning of Christmas for the entire family, look no further than The Old Globe’s world premiere of “Clint Black’s Looking for Christmas.” Based on the album of the same name by Grammy Award-winning country music legend Clint Black, the play is a story of love, faith, and the strength of family and friends told through the singer-songwriter’s lyrics and music. With a few exceptions, all of the songs are from the album or songs he wrote specifically for this play and intertwined into a chocolate-box tale. Black worked extensively with writer James D. Sasser and The Old Globe to bring his first piece of theatrical art to San Diego. 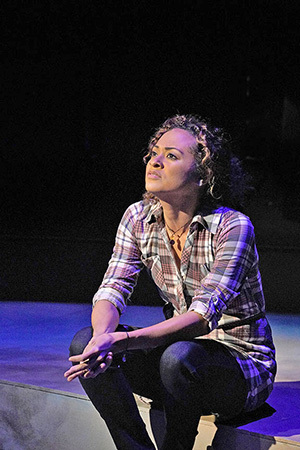 Once it debuted, the play was extended through Dec. 31. And it’s no wonder, as “Looking for Christmas” is a beautiful story with an exceptional message for the holiday season. The plot centers around Staff Sergeant Mike Randolf (Aaron C. Finley), who returns home right before Christmas, but only after tragically losing his best friend just days before the deployment was over. Carrying the ghost of his friend Douglas Miller (DeLeon Dallas) with him, they go through conversations as Mike tries to deal with the guilt, anguish and problems in reconnecting with his family, friends and society. It is with the help of his wife, young daughter and his ghostly friend that he’s given chances to find the spirit of Christmas once again. The musical brigade begins with Mike and his wife Ellie (Kaylin Hedges) video-chatting, which leads to the musical basis of the play, “Looking for Christmas.” Finley exhibits the classic country vocal sound with a few of Clint Black’s signature breaks in his voice, that for the Clint Black fan, is a sure pleasure to hear. With a voice beyond her years, their daughter Jessie (Liana Hunt) is a remarkable talent for her age and brings childlike wonder into the play’s storyline. For those familiar with Black’s album, you will hear the classics “Looking for Christmas,” “The Coolest Pair,” “Christmas for Every Boy and Girl,” and “Under the Mistletoe.” With the addition of new Black songs in the collection, there are some amazing numbers not to be missed. 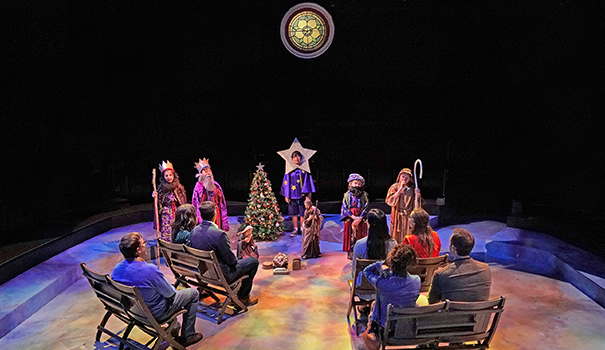 This heartwarming tale is perfection for the holiday season and San Diego is fortunate to be ground zero in the production of this play. The Old Globe has another definitive classic to add to its already impressive repertoire. 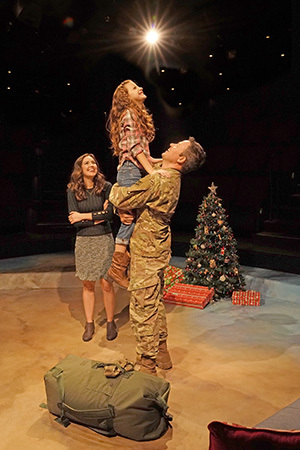 This play is 90 minutes with no intermission, but sadly, it goes by as quickly as the holiday season. The venue is quaint with no bad seats in the house and the entire ensemble brings the joys of the holidays with a relevant message of peace, hope and joy. For more information, visit theoldglobe.org. —Albert Fulcher can be reached atalbert@sdcnn.com.